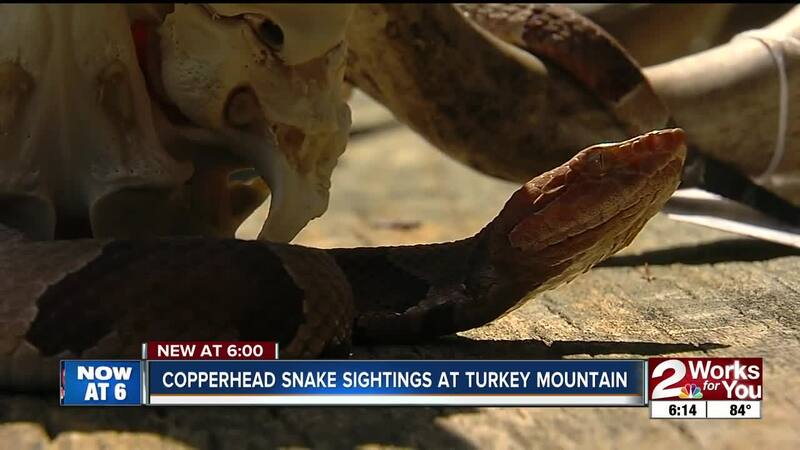 TULSA, Okla. -- Copperhead snake sightings are abundant this time of year around town, specifically Turkey Mountain. The venomous snake is known to strike fear into those who come across it, but experts said it gets a bad rap. Typically, copperheads hide in the brush to stay out of the heat and out of harm. However, on days when it is cool, the snakes venture out looking for food, and you just might cross paths with one. The summer months are a reason to get outdoors. From biking to hiking, Turkey Mountain is a hot spot for those looking for an activity to get their adrenaline pumping. But recent copperhead snake sightings have people's hearts racing for a different reason. “They’re cold-blooded, they don't have arms and legs, they don't look like us,” Carlos Gomez, an Oklahoma Game Warden said. “They’re scary, they're creepy, they're bad and they're poisonous. That makes them even worse." Gomez said that is the common perception of the copperhead snake, but here are the facts, these snakes mean no harm if you're respectful to their homes. “They’re not aggressive,” Gomez said. “And so if we just give them their space and let us have our space, there is no reason for anybody to really be afraid of them." Experts said copperheads are the most docile of all the venomous snakes and usually come out in the cooler evenings, which is when you may encounter one. If you do, walk around it, but be cautious. Here's what you shouldn't do. “The law does require anybody who takes, attempts to take, harms, harasses or captures (wildlife) in any way… to have an Oklahoma hunting license,” Gomez said. This means if you get scared and kill a snake with a stick, you could be fined almost $230. Game wardens said attempting to hurt one could end badly for you as well. “It’s probably going to be afraid of you, and if it acts aggressively it's only trying to say 'Don't try to hurt me, I'll hurt you back,'” Gomez said. If bit, a bottle of anti-venom could cost you in the thousands per vile. During these summer months, be cautious when venturing into the tall brush. Copperheads are native to eastern Oklahoma and are a common sight.